23th and 24th Februar 2013 International cat show in Stockerau At this Austrian Stockerau we showed our Wilda Narsil*CZ. Linda and Tom�, thank you for you big help there. On Saturday she got CACS, on Sunday she got CACS and was nominated. Now she is Supreme Champion. Many congratulation to her !!! 16th and 17th Februar 2013 International cat show in Prague After long time we showed our cats at international cat show in hotel Diplomat. We showed our little male Bohemian Rhapsody by Narsil*CZ for the first time, on Saturday he won his first BIS, on Sunday he was nominated to BIS. Rambo (Bohemian Rhapsody by Narsil*CZ) accompanied by Wilda Narsil*CZ. She got CACS, nomination and Best in Show both days. Februar 2013 All kittens from litter "B" have new loving homes, we wish them all the best !!! 12th December 2012 Prague All kittens from litter "A" have new loving homes, we wish them all the best !!! 18th November 2012 Prague Some new picture litter "B" . Oriental male Borsalino in Red is still available !!! 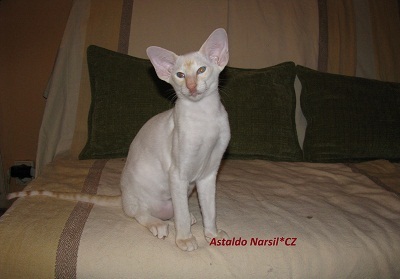 2nd November 2012 Prague Siamese male Astaldo Narsil is available !!! Our kittens from litter "B" are 6 weeks old. More informations in kittens section !!! 27th and 28th October 2012 World cat show in Zagreb In zagreb in Croatia was World cat show. Our cattery represented SC. Winter Storm Narsil*CZ, she reached HP and was nominated to Best in Show. GIC. Valaraukar Narsil*CZ, norwegian forest male reached CACS. 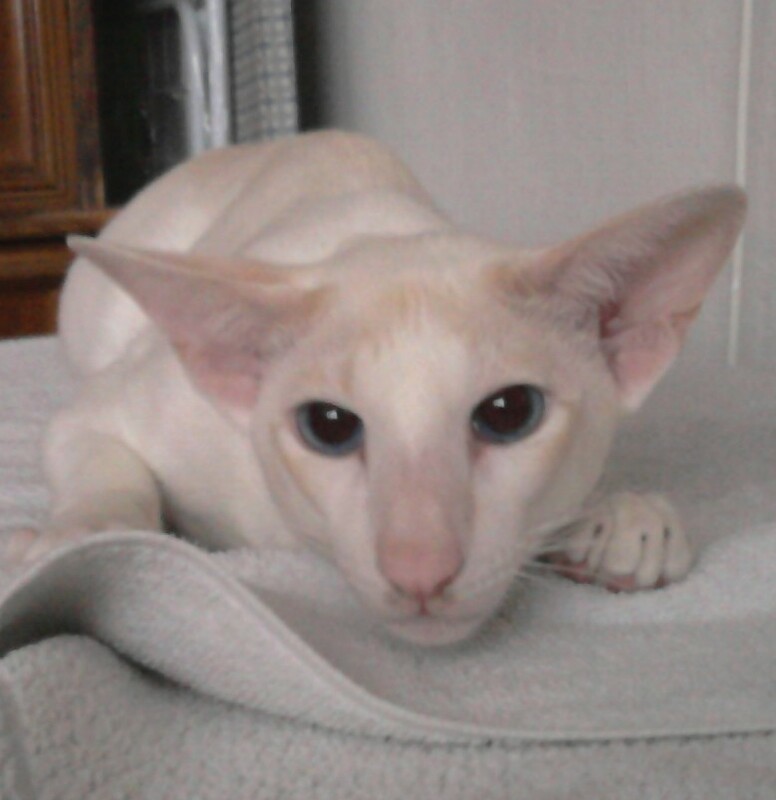 23th September 2012 Prague From litter "A" we have two siamese male available. More in kittens section !!! New kittens from Tennesse and Borsalino was born 20th September 2012, litter "B". More informations and picture later. 19th June 2012 Prague We have kittens !!! 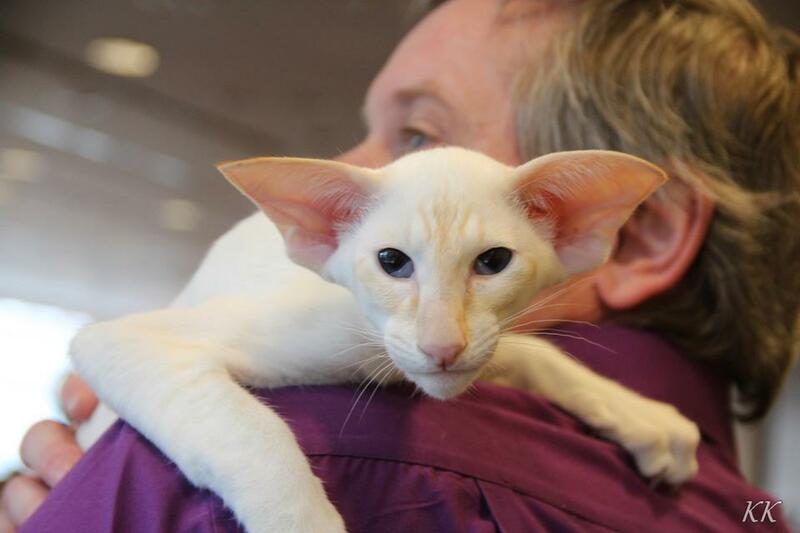 10th March 2012 International cat show in Rodovre, DK This Saturday we showed our cats in danish Rodovre. The trip was long but the result was great!!! Winter Storm Narsil*CZ 3x CACS, 3x nomination and 3x Best in Show !!! Yulliano Narsil*CZ won all three show and Vanya Narsil*CZ got 3x certificates and 1x Best in Variety. Many congratulations all !!! My big thanks to our friends Lars and Christina !!! 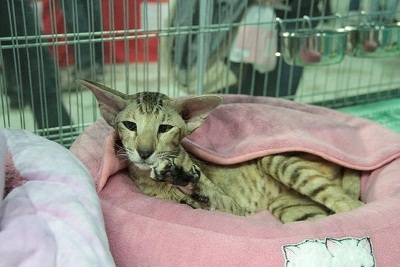 21st and 22nd January 2012 International cat show in Prague Winter Storm - Saturday - CACS, nom. Sunday - CACS, nom. and Best in Show. On Sunday our Winter Storm reached DSM title!!! 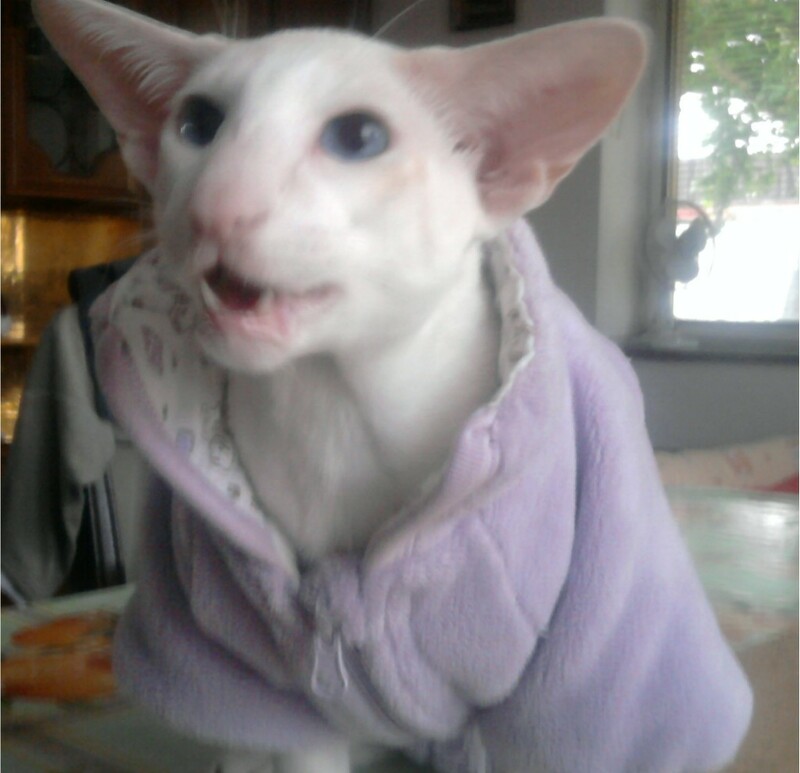 I am very happy and proud, because Winter Storm is from our cattery !!! 18th and 19th February 2012 International cat show in PragueOur friends from Danmark showed Yulliano Narsil*CZ and he had very succesful show weekend. Yulliano won Best in Show both days, on Sunday won Best in cattegory and Best of Best II. Dear Lars and Christina, thank you very much!!! 23th December 2011 We wish you Merry Christmas and happy New Year 2012 !!! In November we attended some show with our Winter Storm. Here are results. 19th and 20th November 2011 International cat show in Pardubice Winter Storm - CACS, nom and Best in Show both days. 12th November 2011 international cat show in Wien Winter Storm - CACS, nom and Best in Show. Her daughter ZZ Top got Ex1, nom and Best in Show in big competition. I was very happy and congratulation to Jana !!! 29th and 30th October 2011 World show in Pozna� Last weekend in october was World cat show in polish Poznan. The trip was little bit longer, than we expected, because of two traffic collapses in towns. The show was very nice and very succesful for us. There was GIC. P.Tonya Graves Narsil*CZ (owner. M. �anda), she got CAPIB and Best in Variety, GIC. Winter Storm Narsil*CZ, JW got CACS, Best in Variety and nomination to BIS. Our Wilda got CACS and seychelois girl ZZ Top Narsil*CZ our friend Jana Ex1. 17th September 2011 International cat show in Vinicne IC. Winter Storm Narsil*CZ, JW got CAGCIB, GIC. Wilda Narsil*CZ, JW - CACS. After two year our Borsalino was at show, he got HP. P. GIC.Tonya Graves Narsil*CZ (owner. M.�anda) got CAPIB, nomination and BIS. Many congratulations !!! 6th September 2011 Our little Zuckerkandl is booked!!! 30th & 31st July 2011 International cat show in Prague Winter Storm was nominated and won Best in Show for both days. Her daughter ZZ Top moved to her new home. Now she lives with our friend Jana in cattery Simon*CZ. Yulliano moved to his new home two days later. Now he lives with our friends Lars and Christina in cattery Mi-Chi*DK. 24th July 2011 Seychelois male Yunnus Yaeger Narsil*CZ and his new family sent us some news and nice pictures. Yunnus is grow up very well and is nice big boy. In age 8 months his weight is 4,5 kg. Helena and family, thank you very much for your care !!! 20th July 2011 We added new pictures of our kittens. Zuckerkandl Narsil*CZ available as the pet. 25th & 26th June 2011 International cat show Brno Yulliano participated international cat show in Brno Interfelis. All judges loved him so much and he won both days Best in Show. 4th June 2011 International cat show in P��bram At this show we met our friends from Danmark and Germany. Yulliano was nominated to Best in Show on Saturday. 14th & 15th May 2011 International cat show in Most I looked forward to this show. I met my friends and spend there nice weekend. My big thanks to Petra and Lukas :-) Yulliano Narsil*CZ won both day Best in Show 3 - 6 months. I was really very happy, because on Saturday Yulliano reached titul Junnior Winner. Congratulation my dear!!! 1st May 2011 International cat show in �ilina Yulliano Narsil*CZ Best in Show. 30th April 2011 International cat show in Ostrava Yulliano Narsil*CZ Best in Show. 6th April 2011 We have new kittens!!! Proud parents are our Winter Storm and Borsalino. Look at kitten page. 26th and 27th March 2011, International cat show in Usti nad Labem Our boy Yulliano Narsil*CZ won his fist show for both days. 17th March 2011 Male Yunnus Yaeger has a new loving home in Prague. Our Yavanna Kement�ri still available. 12th March 2011 It was very nice Saturday, but for me too sad. Our Yaniczka left us forever. Thank you so much for your short time with us. 31th Januar 2011 Our kittens are 9 weeks old. We added new pictures. Girl Yavanna Kement�ri and boy Yaeger are still available. 25th November 2010We have kittens, proud parents are Tennessee and Borsalino. Update of the sites, more info about shows later. 5th April 2010 New pictures of Xanthe Narsil*CZ in 12 weeks of age. Xanthe is already booked. More in kitten section. 31st March 2010 Campanula Calibra*CZ got the title DM. I would like to thank to owners of Santana Narsil*CZ - Kv�ta and Stanislav Lehk�, Tonya Graves Narsil*CZ - Martin �anda, Theodena Narsil*CZ - Daniela �epov�, Vanya Narsil*CZ - Christina and Lars Kyed, Vairoe Narsil*CZ - B�ra Vencl�kov�. Thank you for your prezentation and for reaching titles Interchampion. 20th and 21st March 2010, International cat show in Prague Wilda got first and second CAGCIB, and both days was Best in Show. 20th March 2010, International cat show in PragueOur Winter Storm Narsil*CZ, JW is Kitten of the year 2009 in the Czech Republic. Congratulation !!! 13th February 2010, International cat show in Prague Wilda - CACIB, Best in Show. Wilda is now Interchampion. 30th January 2010, International cat show Ebreichsdorf We didn't plan to go to the show. But we received message, that Wilda is Little mIss Austria and went there to pick up the cup. We also presented Tonya Graves (owner Martin �anda) there and she reached the GIC title.Congratulations! Wilda got CACIB and BOB III, Tonya Graves was nominated for BIS. 16th and 17th January 2010, International cat show �st� nad Labem Winter Storm Narsil*CZ on Saturday CAC and BOB II, Wilda Narsil*CZ on Saturday CAC and nomination, Tonya Graves Narsil*CZ nomination. On Sunday Winter Storm got second CAC and nomination, Wilda Narsil*CZ got first CACIB and won BOB III, Tonya Graves Narsil*CZ got CACIB and was nominated. Congratulation !!! 8th January 2010 We have kitten, more information in kittens. 12th and 13th December 2009, International cat show Prague Wilda Narsil*CZ on Saturday got first CAC and Best in Show. On Sunday she got second CAC. 14th and 15th November 2009, International cat show Pardubice Winter Storm Narsil*CZ both days BIS 6-10 months. 24th and 25th October 2009, World car show St. Gallen (CH)Last October weekend we went to the World cat show in ST. Gallen, Switzerland. Our cattery presented Wilda and winter Storm. Wilda was judged by Mrs. ��hov� (CZ) and nominated her to BIS. Winter Storm was judged by Ms. Luis Coste (F). Got Ex 1 and Luis nominated nice chocolate bicolor, who wan BIS on Sunday. 12th and 13th September 2009, International cat show Bologna (I) We looked forward the show in Italian Bologna. We took both girl. Winter Storm won both day BIS 6-10 months, on Saturday was Best of Best II and on Sunday Best of Best I. Wilda was nominated on Sunday. 29th and 30th August 2009, International cat show Chodov� Plan� Wilda Narsil*CZ both days BIS 6-10 months and Best of Best I. On Sunday Wilda reached title Junior Winner !!! . 22nd and 23th August 2009, International cat show Moedling (A) Wilda Narsil*CZ both days BIS 6-10 months, Tonya Graves Narsil*CZ (owner Martin �anda) both days nominated and on Sunday BOS. Our friend �eljko from Croatia presented Valaraukar Narsil*CZ and won BIS 6-10 months. Big congratulatio !!! 11th and 12th July 2009, International cat show �st� nad Labem Winter Storm Narsil*CZ both days BIS 3-6 months. On Sanday Stormy reached title Junior Winner. Borsalino was presented at this show too, on Saturday won Best of Best I and reached title DSM. Congratulation to our darlings. Our friend Lenka with her daughter B�ra visited us after this show, B�ra liked our Vairoe and the same evening Vaire found new loving home. 27th and 28th June 2009, International cat show Brno Winter Storm Narsil*CZ both day BIS 3-6 months and BEST of BEST I. 23rd June. The site is updated. Wilwarin and Winter Storm added to Our females. More information will come later. 7th June, International show in Wiener Neustadt. We took three our cats to this Austrian show. Borsalino obtained the Honour Prize and was nominated to BIS. Winter Storm was very successful at her first show and won BIS kitten 3 to 6 months in Category IV. Our black NFO kitten Vairoe got Ex 1. 6th June 2009. Waldo moved to Plzen where he start to live with Nadezda and her family. 31th May 2009. Wilwarin left for her new home where she wil live with Klara and her partner. Wirgo left for his new home today too. 18th May 2009. Wingo left for a his new home. 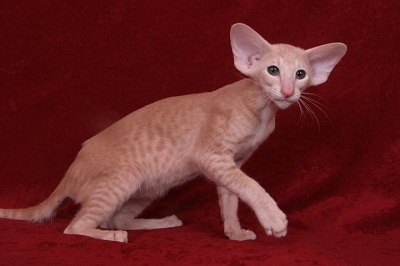 He will live with Lenka, her husband and oriental cat - his new friend. 16th and 17th May 2009, International Cat Show in Most. Vanya Narsil*CZ was exhibited at this show by her new owners - Christina and Lars Kyed from Denmark,DK*Mi-CHi's cattery. Vanya obtained Ex 1 on Saturday, on Sunday she was nominated for BIS and lost by a lottery. 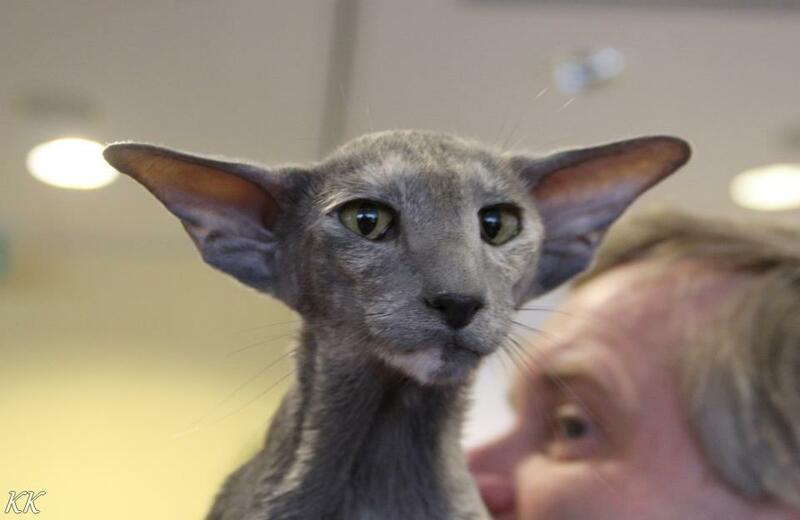 11th and 12th April 2009, International Cat Show in Hradec Kr�lov�. We had 2 cats here. Borsalino was nominated for BIS on Saturday but lost, on Sunday he won BIS and BOB 3. The second cat here was Tonya Graves Narsil owned by Martin Sanda. On Saturday she got her certificate, BIV and was nominated for BIS, on Saturday the same result. 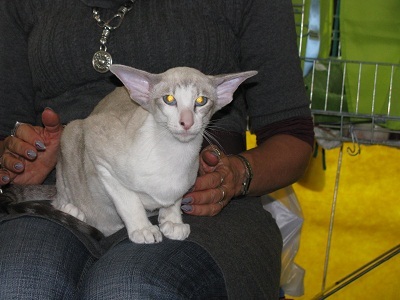 14th February 2009, International Cat Show in Praha. Ulmo, son of Tennessee and Borsalino won CAC, BIS category IV and Best of Best 2. 2nd February 2009 Tennessee gave us 6 kittens, 3 oriental and 3 siamese. More information i n the KITTENS section. 22nd January 2009 Campanula gave us 4 kittens, 2 male and 2 females. More information in KITTENS section. 20.7. 2011 We added new pictures of our kittens.  Zuckerkandl Narsil*CZ available as the pet. 25. a 26.6 2011 International cat show Brno Yulliano participated international cat show in Brno Interfelis. All judges loved him so much and he won both days Best in Show. 4.6. 2011 International cat show in P��bram At this show we met our friends from Danmark and Germany. Yulliano was nominated to Best in Show on Saturday. 14. a 15.5 2011 International cat show in Most I looked forward to this show. I met my friends and spend there nice weekend. My big thanks to Kl�ra and Honza :-) Yulliano Narsil*CZwon both day Best in Show 3 - 6 months. I was really very happy, because on Saturday Yulliano reached titul Junnior Winner. Congratulation my dear!!! 1.5. 2011 International cat show in �ilinaYulliano Narsil*CZ Best in Show. 30.4. 2011 International cat show in Ostrava Yulliano Narsil*CZ Best in Show.